Songs have, for more than 70 years, taken a central role in North Korean cultural production. They form the dominant soundscape, reflecting ideology, whether in Soviet-inspired revolutionary songs of the first decade of North Korea’s existence, in the Chinese-inspired incorporation of folksongs into nationalist discourse in the second decade, or in more recent state-sanctioned pop. Songs mark political transitions: they function as newspaper editorials, promoting new policies and underpinning the monolithic unity of the leaders, the party and the people. Under North Korea’s juche ideology, ‘seeds’ are implanted in the lyrics and in the leitmotifs of songs. Songs are then recast in multiple forms to increase the penetration of the ‘seed’. They become background music, festival music, and the music of mass games: the message remains even when lyrics are replaced by instrumental or orchestral arrangements. 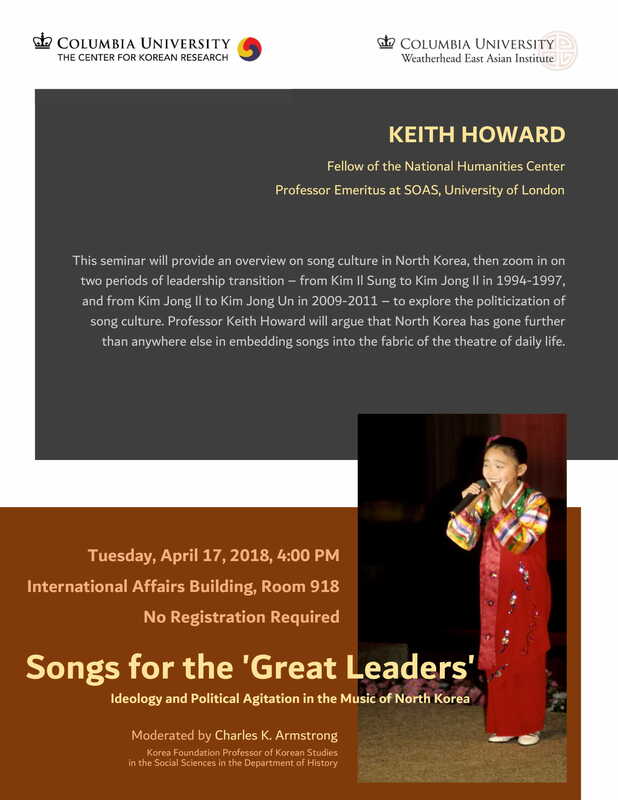 This seminar provides an overview, then zooms in on two periods of leadership transition – from Kim Il Sung to Kim Jong Il in 1994-1997, and from Kim Jong Il to Kim Jong Un in 2009-2011 – to explore the politicization of song culture. I offer brief comparisons to Stalin’s Soviet Union, Mao’s China, Karimov’s Uzbekistan and Assad’s Syria, but argues that North Korea has gone further than anywhere else in embedding songs into the fabric of the theatre of daily life. Professor Keith Howard is a Fellow of the National Humanities Center, North Carolina. He is Professor Emeritus at SOAS, University of London, and was formerly Professor and Associate Dean at the University of Sydney. He has written or edited 20 books and 150 academic articles. He has been a regular broadcaster on Korean affairs for BBC, ITV, Sky, NBC and others. He was editorial chair for the SOAS Musicology Series (Ashgate/Routledge) for nine years (2008–2017), and founded and managed the SOASIS CD and DVD series as well as OpenAir Radio. 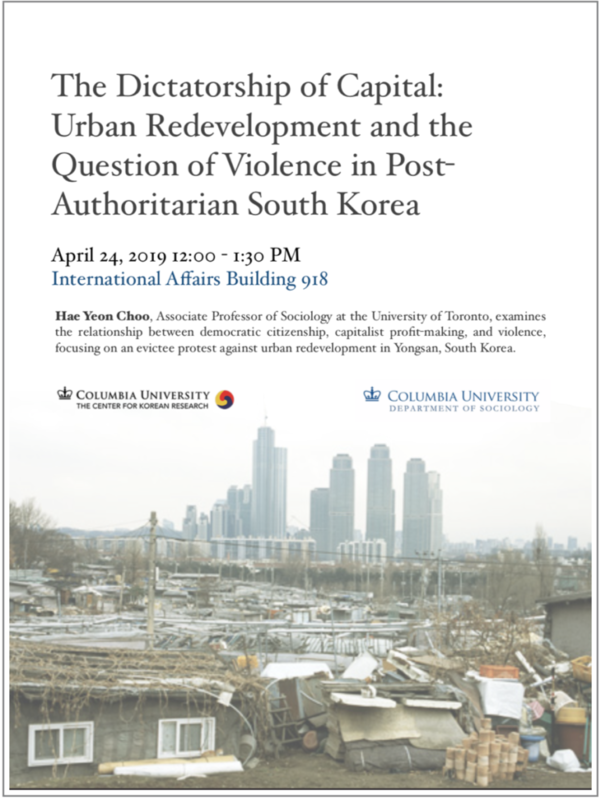 He serves on the boards of the British Forum for Ethnomusicology, International Council for Traditional Music, and sits on editorial boards for Music Theory Spectrum, Asian Ethnology, Papers of the British Association for Korean Studies and OMNES.